Ivory now and then a band comes along that makes you sit up and notice. Elephants On Tape are one such, we’ve featured them on a few occasion and they are regulars on the SWIT Towers turntable. 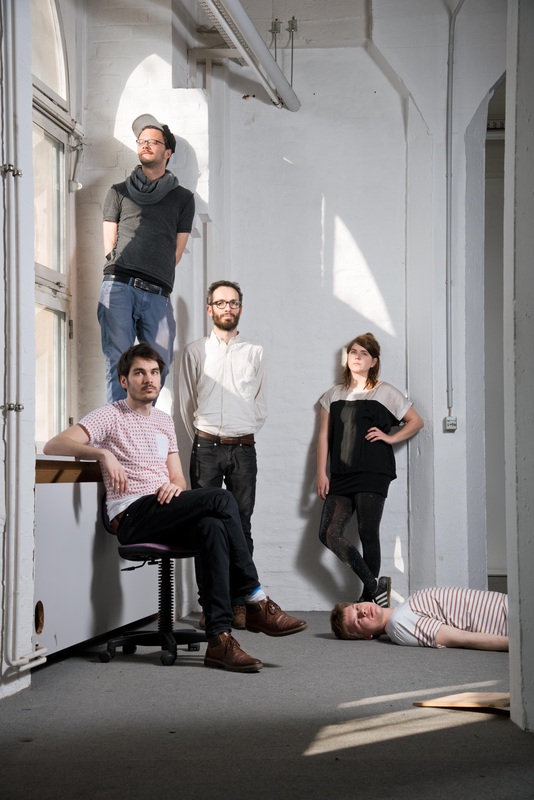 The band make “sophisticated, clever, multi-layered music” as attested by their wonderful debut LP “Lightweights” which has just been released on Kick The Flame. We put a trunk call (?!?!?) in to Markus and Lisa from the band to find out some more about them and the new record. They were more than equal to the tusk at hand. MARKUS: We started the band in 2013 when Lisa and I met at a party and decided to make music together in some sort of way. Though we didn’t know what that would sound like, yet. LISA: It didn’t take us long to find the right companions in Robert, Lukas and Patrick (who later passed on the drumsticks to Hans). We started the band with the most different musical backgrounds one can imagine: punk, rap, reggae, psychedelic, but with each of us having a great interest in a variety of genres. MARKUS: Soon we found the greatest overlap of our taste is a mixture of electronics and indie – or, in other words, Indietronica. How are you feeling about the LP release? Nervous much? MARKUS: Yes! We probably never showed anyone something that personal before. When we started, we wrote our songs as a collective from the scratch. With this record, it was the first time for Lisa, Robert and me to bring songs into the band where the lyrics and the structure would be almost finished, which we would continue working on together. Also, we made the record to somewhat of a collective diary, since we did most of the recording and producing by ourselves in our living rooms, over the course of two years.So yes: we hope there will be people who’ll like what we did there. LISA: We feel excited, proud and relieved at the same time. Putting something out there that’s so important to you makes you feel kind of vulnerable. But we’re really looking forward to showing people our „baby“, the music we’ve been working on for so long. LISA: haha, to be honest – it was „Boulevard of Broken Dreams“ by Green Day. I heard it on the radio when I was thirteen. I then decided to play the guitar and have a band someday. MARKUS: When I heard Notwist’s „Neon Golden“ for the first time and I was just blown away by the incredible details in their sound. Never before I was touched by music in a way like that – it has to be the record I listened to the most since then, still discovering new things I like about it. MARKUS: For me, that’s „Traffic Signs“, since it was actually the first song I wrote (or more so: showed to anyone), guess that’s why it means a lot to me. LISA: „Ask The Moon“ is very important for me, it was the first song I wrote for ELEPHANTS ON TAPE in 2011 and we’re still playing this song on our concerts and it’s always moving. Robert did a Remix of it for our LP RE//EOT in 2016 and now we’re playing that rework live at our shows. It’s wonderful what happens when you look on tracks in different ways, times or with different eyes. Lisa: For me, it’s Lizzy Powell (Land of Talk) and Lou Rhodes (Lamb). I discovered their music when I was seventeen and since then I started to write my own songs. I’m still enthusiastic about their voices and songwriting – fragile, emotional, catchy but never one-sided. MARKUS: As I mentioned before, the Notwist have always been a big influence on me. Their music inspires to do things differently, and never to stop looking for new ways to do so. As a band, do you argue much about songs, musical direction etc.? LISA: With five people seeing music from five different angles, one might think that arguing is inevitable. But each one of us is sort of responsible for certain components in our music, on which we know we can trust each other to pull in the same direction. What’s the best (other) new band you’ve heard recently? MARKUS We recently went to a concert where the trio „Soft Grid“were playing as support, and they really blew us away with their energy! Also, their setup was special, besides drums, guitar and bass it involved a violin, different samplers and synths and a glockenspiel – definitely worth checking out! Lisa: Also Klangstof from Amsterdam – Markus took me to a concert 2 months ago and I was captivated by their sound and their songs throughout the whole concert, without having heard from them before. MARKUS: Lilabungalow – sharp guy. For many years this was the soundtrack of our tours and aftershow parties. It’s beautifully arranged, wonderfully weird, deep and catchy. LISA: „Everything in its right place “by Radiohead – sounds like simple lyrics and simple melodies till you seriously try to sing it. What is exciting you on the German music scene? MARKUS: That is hard to answer since I think I don’t find the German music scene to be particularly interesting – Not more or less than any other music scene. Don’t get me wrong, there is really great music here, but I think that can be found everywhere, once you dig past what’s on commercial radios. MARKUS: „None taken“, as a response to „no offence“. I use it whenever there’s a chance to. MARKUS: Being able to do what we do – kind of like we’re doing now but with a better budget and a bigger team. LISA: Definitely, because excess points out negative and positive edges and does not lead you outside of the comfort zone.